With parent company eBay’s continued focus on mobile, PayPal has been adding a number of compelling innovations and features to its iPhone and Android apps. Most recently, the company added Bump technology to both of its free apps, which allows you to transfer money and initiate transactions by simply by tapping smartphones together. 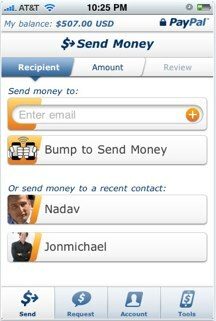 In the next versions of the app, PayPal has a few nifty features in store for users. PayPal’s President Scott Thompson tells me that an upcoming version of the company’s iPhone app will include the ability to make a donation to a charitable organization directly from the app. PayPal has partnered with 20,000 various charities, including Autism Speaks and Save The Children, to allow users to make a donation at any time on the go directly from their PayPal account. As shown by the massive fundraising efforts via texting in the aftermath of the earthquake in Haiti earlier this year, consumers are looking for simple ways to make donations. There’s no doubt that this feature is good news for charitable organizations everywhere, considering the million-plus downloads PayPal’s iPhone app has seen. Another interesting feature to be incorporated in an upcoming version of PayPal’s iPhone app is one that will save you the trip to the ATM or bank. When you receive a check, you’ll be able to take a picture of the front and back of a check and and PayPal will deposit the amount from the check’s account into your PayPal account. You can then use the funds to make any purchases on the web via PayPal. Some banks, including Chase, currently allow you to do this, but it’s totally new to PayPal. I’m told the new version of the iPhone app is to be released in the next few months.